1. The Americans are smart enough to go forward with enhancing OSINT as Open Intelligence to the Academic field. “U.S. Sen. Kay Bailey Hutchison (R-Texas), a member of the Senate Appropriations Committee, said Thursday that the committee has approved $1 million for open source intelligence and intelligence analysis at Sam Houston State University. The bill is now ready to be considered by the full Senate. “America’s military and intelligence services are constantly on guard for potential threats against our homeland,” Hutchison said. “MySpace on Tuesday will release as open source a technology called Qizmtthat it developed in-house to mine and crunch massive amounts of data and generate friend recommendations in its social-networking site. John Stasko and the computer scientists at the Information Interfaces Lab at Georgia Tech may not have found the Holy Grail of visual analysis but they have come pretty darn close with their Jigsaw product. This extraordinary visualization tool automatically extracts entities (names, places, dates, etc.) fromplain text documents. 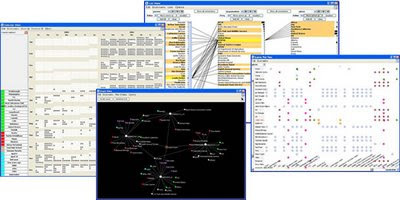 Then, it automatically creates a visualization of the relationships between those entities and the documents containing them. The screenshots below do not do it justice (I hope to have a video of the product in action within a couple of days, though). The program is fully customizable so you can add or delete data, designate entities or create relationships to modify what the automatic entity extractors come up with. The real power of the tool comes into play after the data is in the program. You can play with it in a variety of powerful and interesting ways all accessible through a drop dead easy user interface. The software is continuously improving. On the horizon is the ability to use web input and there is a long analyst generated to-do list that the grad students at GA Tech are cranking through one at a time. The software runs on a desktop and was developed with a DHS grant so government and academics should reach out to John for a test copy. GA Tech is also home of the Visual Analytics Digital Libraryand well worth checking out. Yesterday, I posted my initial reaction to an extraordinary piece of software called Jigsaw I saw demo-ed during my visit to GA Tech for the Workshop on Visual Analytics Education sponsored by NVAC. Today, John Stasko and his team uploaded a video of the software in action that is a must-see. I understand the video is a little old so some of the functions I saw are not in this video. The good thing about John and his band of software wizards, though, is that they are constantly improving the product. The GAO (Government Accountability Office) has held up the deployment of the DHS (Department of Homeland Security) critical (non-classified) information sharing system. The unlucky group that must deal with the herculean task of launching a collaborative social network of law enforcement, state, local federal and tribal agency members must answer some tough questions before continuing. That group is the Homeland Security Information Network Advisory Committee (HSINAC). Large scale information sharing is what social networking is all about. Creating a critical mass and going viral is one of the phases of any successful launch. Having a “well articulated business plan” and “management controls” in place *before* launch is not going to help. Look at MySpace, FaceBook, Slashdot, Craigslist, Digg, Reddit,Twitter, or even Tipd which is in the process of trying to create social site for finance. All were launched with significantly less than the $150 million that DHS is going to spend on their critical information portal. Here is what DHS should do to create an effective information sharing portal. 1. Use open standards of course. No proprietary software that has to be deployed to each desktop or department. 2. Immediately take the information resources they have available now and publish them. Lot’s of great tools for that. 4. Faciliate the social aspect. Create a Twitter like functionality so first responders can follow each other and link to each other’s resources. 5. Provide a feed reader capability (or just let everyone use Google Reader) so the end users can follow the stuff they determine is important. You know that this could be deployed in a matter of days, maybe weeks since it is a government project. Certainly within the $3 million budget that DHS has for maintaining the failed system already deployed through next September. The only thing that may take significant investment is the credentialing system needed to keep the bad guys off the network. No social network has ever succeeded through central planning, outreach efforts, and management controls. Every successful new information sharing network has just happened, usually explosively. Unless the DHS can come to grips with that the Homeland Security Information Network-Next Generation is doomed to fail. The list of Free software tools for designing productive community sites is showing us the future of the intelligence realm: how to become rapid and collaborative in an open world.